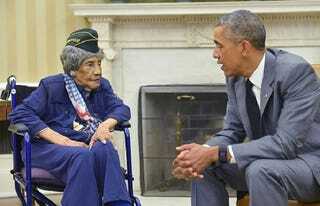 President Obama met on Friday with the oldest living woman veteran. Emma Didlake, a spritely 110-years-old, joined the Women’s Army Auxiliary Corps in 1943, she was 38 when she joined. Didlake served as driver during World War II, and after the war became active in the Civil Rights movement. According to the White House, she marched with Martin Luther King, Jr. in 1963. “It’s a great reminder of not only the sacrifices that the Greatest Generation made on our behalf, but also the kind of trailblazing that our women veterans made, African-American veterans who helped to integrate our Armed Services,” the President said during the meeting. Obama shared a photo of the meeting on Twitter, calling Didlake a “true American hero.” Indeed, she seems like a pretty amazing lady.